The rising preference for vegan diets in the West is fuelling demand for the humble Indian raw jackfruit. Shipments of the tender or raw jackfruit in frozen, dried and ready-to-eat forms are on the rise to countries such as the United States and Europe, besides West Asia. Also, the seeds of the jackfruit, whose flour is used in bakery products, is finding great demand from countries such as the United Kingdom and Germany, among others. Due to its fibrous texture, raw jackfruit is considered as a vegetarian substitute for meat and chicken. In fact, tender jack is also being called as dummy meat, experts said. “Our exports of tender jack fruit have risen to around 500 tonnes in the past four years,” said Surya Shastry, Managing Director of Phalada Agro Research Foundations Pvt Ltd, a Bengaluru-based company that sells organic products under the Pure & Sure brand. 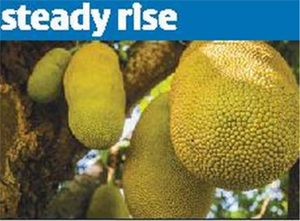 “We expect the raw jackfruit exports to be around 750-800 tonnes in the current financial year,” Sastry said. Phalada is exporting the tender jackfruit in ready-to-eat form, after processing it at its facility in Bengaluru. Phalada Agro, which sources raw jackfruit from its network of farmers in Karnataka, is now looking to tap the North-Eastern States to boost its supplies from the region, Sastry said. Similarly, JackFruit India, a Cochin-based firm, which started shipping the carpels in freeze dried form about seven months ago, has witnessed a major demand in markets such as the UK. “We have, so far, exported about 7 tonnes of raw jack and around 12 tonnes of the seeds,” said Alex Chacko, Managing Director, JackFruit India. The company has opened a branch in Cyprus from where it repackages its products and sells in the UK market. Chacko said JackFruit India is working with a German company for developing a sausage-like product made from the tender jackfruit, which is likely to be launched over the next few months. The flour made from jackfruit seeds is gaining acceptance among the bakeries in Europe, where it is used in Chacko said JackFruit India is working with a German company for developing a sausage-like product made from the tender jackfruit, which is likely to be launched over the next few months. The flour made from jackfruit seeds is gaining acceptance among the bakeries in Europe, where it is used in making biscuits and cookies, Chacko said. However, there is a stiff competition from countries like Bangladesh, which are supplying the jackfruit seed flour at 30 per cent lower price. “Cheap labour and a weak currency is helping the Bangladesh exporters,” Chacko said. The jackfruit seeds are also nutritious and rich in vitamins such as thiamine and riboflavin. Shree Padre, Editor of farm magazine Adike Patrike and an expert on jackfruit, said the commercialisation of this tree-based fruit in the country is still in early stages and there are plenty of opportunities in the world market. The Indian entrepreneurs and growers are yet to gear up to encash these opportunities. “There’s a need to act fast as other countries like Thailand are catching up,” Padre said adding that there is a need on research to focus on developing the tender jack varieties to cater to the growing demand in the long-run. Officials at the Agricultural and Processed Foods Exports Development Authority, admitted that exports of jackfruits and related products were on the rise in recent years. However, it has been difficult to quantify the volume and value of these shipments as there is no separate HS (Harmonised System) code for these products. They are either part of processed fruit/vegetable or miscellaneous processed items, they said. Shaji Mathew of Wynad Exports, who ships tender jackfruit in the both frozen and chip form to the US and Australia, said the demand has been increasing annually from these countries. Raw jack is used in sandwiches and also burgers as an alternative to meat and chicken, he said.